The Wedding Lounge (Dumfries) is a new wordpress-based website built using child themes, custom menus and CSS3 - more in line with the way a wordpress framework ought to be customised. There is still a concession to the functions.php file as the parent theme version takes precedence over the child theme in this respect but this may change in future. 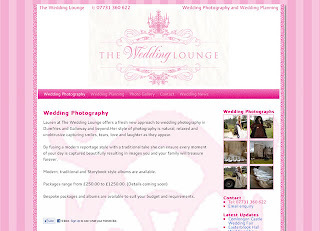 The Weddding Lounge website is to promote the services of an upcoming wedding photographer and wedding planner. The site is ready for the start of the wedding shows and fairs being held in Dumfries and Galloway in 2011 so provides an online source of information, as well as linking with the existing facebook profile and image galleries.